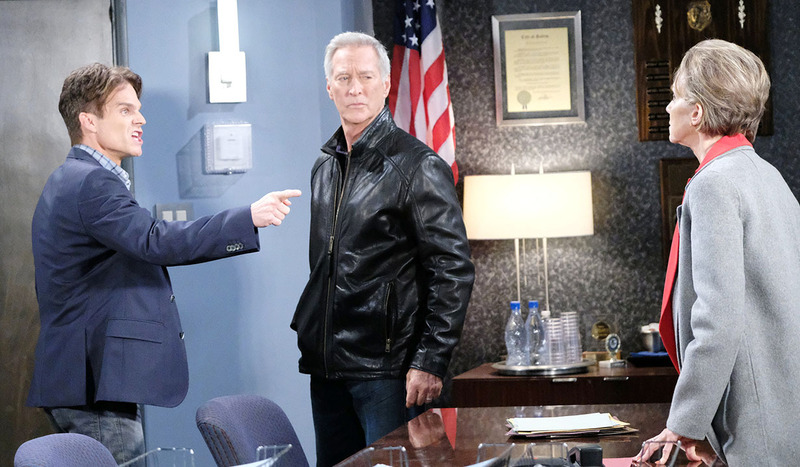 Monday March 25, 2019: On Days of our Lives today, Brady's visit angers Stefan, Diana makes two big admissions, and Ted sees a familiar face. At the hospital, Brady and Leo bicker about access to John. Marlena won’t keep Leo from John but he’s busy right now. Leo tells Marlena he’s anxious to find his father because he’s running out of funds. Brady learns there was a shooting at the DiMera mansion and leaves. Marlena writes Leo a check – he’s family. Leo apologizes for getting off on the wrong foot and wants to start fresh. 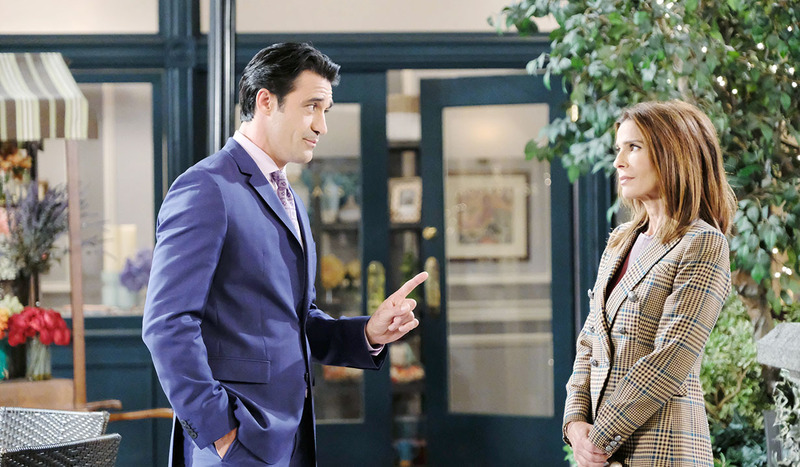 At the DiMera mansion, Stefan takes Chloe’s hand as he tells Ted and Hope they must find the cartel people before someone gets hurt. Stefan smirks about Ted’s new position as they leave. Stefan proposes chess or singing to relax Chloe. Stefan begs until she agrees to sing, then is mesmerized by her vocals. He learns Brady’s there and Chloe asks Stefan to let him in. 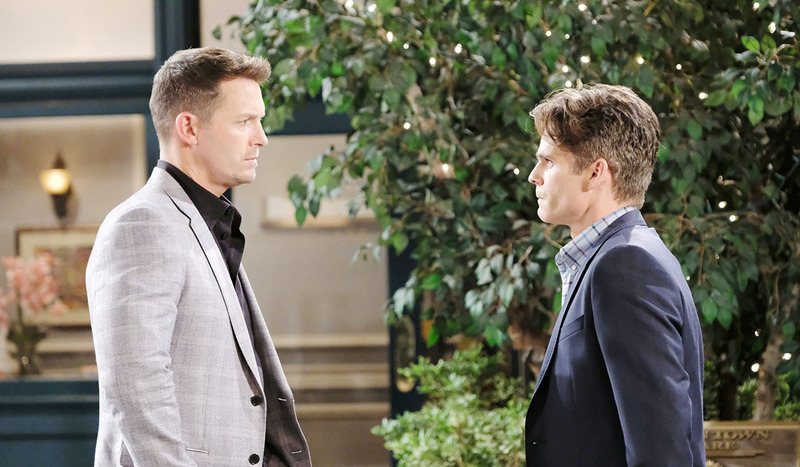 Brady storms in and Stefan assures him he’s stepped up security. Brady talks to Chloe alone and wants her to live with him. Chloe insists she feels safe there. He thinks she’s developing feelings for Stefan. Chloe admits they kissed and arguing ensues until Brady plants a kiss on her. They pull apart as Stefan appears. Chloe exits and Brady and Stefan exchange barbs as Brady leaves. Chloe rejoins Stefan, but only to say goodnight. After, Stefan curses Brady. In the square, Ted asks Hope for coffee, but she tells him to stop playing games and pretending she’s not married. Ted wants a good working relationship, but Hope feels he wants more. Ted insists he’s just flirting like a Frenchman. Hope prefers he stop. Rafe lets Kate into the pub and explains Roman lent him the place for a dinner with Hope, but she took off with Ted. He rants about the new D.A. and Kate can’t believe he was appointed – he must have skeletons in his closet. Rafe decides he’ll dig up dirt on him. Later, Hope rejoins Rafe in the pub and kisses him passionately. Rafe understands the call of duty but worries Ted will cross the line. Hope asks him to trust her. They kiss. Hope thanks Rafe for everything he did tonight and they express their love. At the hospital, Leo listens as Marlena takes a call from Eli that Diana confessed. Later, Kate visits and Marlena updates her that John’s ex and Leo’s mother, Diana Colville, poisoned her, not Kristen. Kate marvels at the psycho family and wonders what Leo’s father must be like as Marlena talks more about him. Leo arrives at the SPD and confronts his mother, who screams that he cannot judge her. John intervenes and Leo warns Diana she’ll never see him again. Diana calls him an ungrateful loser. Leo has had to put up with this for years and is glad he can now call John father – he’s a good man. Diana sneers, “He’s not your father you idiot.” She made it all up and explains how she found and altered the DNA test. Leo digests that Richard Cooper really was his father and lunges across the desk to choke Diana while John pulls him off and holds him back. Leo hollers that every minute of his life has been a struggle to stay sane. John knows he’s hurting. Leo exits and Diana tells John she’s alone. He says it’s what she deserves and slams out. 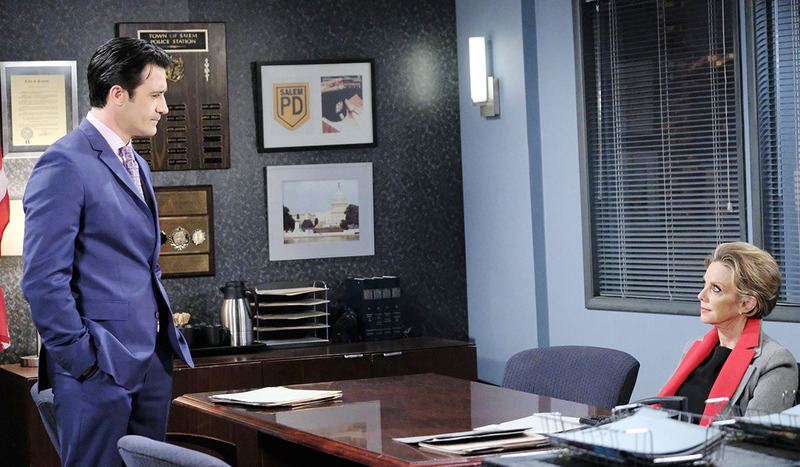 Outside, John advises Eli to add tampering to Diana’s crimes. Meanwhile, Ted joins Diana, who says it’s been a long time. She learns his wife passed away and muses, “That’s strange.” She just saw her six months ago. Ted insists that’s impossible. Diana supposes she must have been mistaken, but Ted looks uncomfortable. 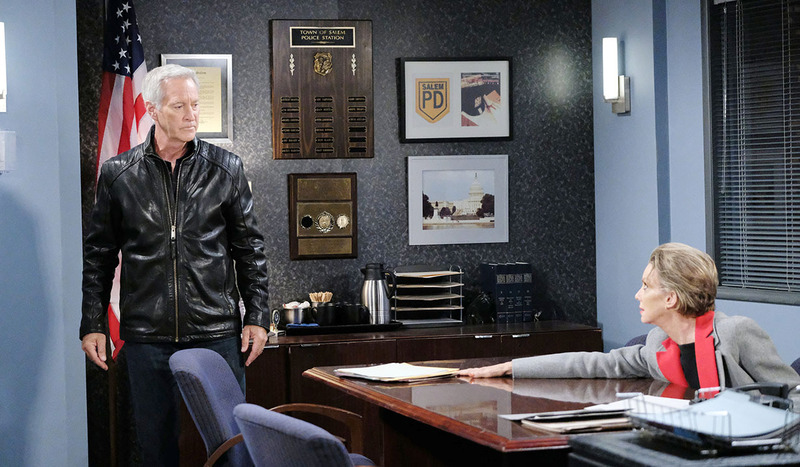 John embraces Marlena in the hospital, updates her on Diana, and relays that Leo’s not his son after all. In the square, Leo informs Brady he’s not his brother and says he and everyone else in town who hates him got what they wanted. Brady gives Eric a hard time.